If you are over 50, and still have your mother, you are lucky. Even if the relationship is fraught, there is someone on this earth who cares about you in a way no one else does. When one's mother is in her 70s, 80s or 90s, she is likely to say, "Don't make a fuss". You may be in that rarest of positions, knowing exactly what she would love. You could giv e a gift of time or effort, such as planting a windowbox or taking her to visit a friend. But if you want to give a gift, here are some choices for matriarchs or any elder woman whom you wish to celebrate on Mother's Day, a birthday or just because. Spontaneous gifts are especially appreciated; joyful surprises are relatively few in later years. She may tell you that you shouldn't have, but will tell everyone you did. 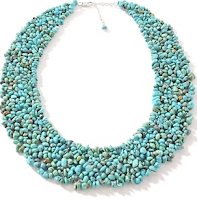 Turquoise and sterling silver woven necklace, price, $59.90 from HSN. Older women can pull off an assertive necklace, and this colour looks lovely with grey hair. When I see an 80-year-old women on the street, I notice that she often wears a dated watch. 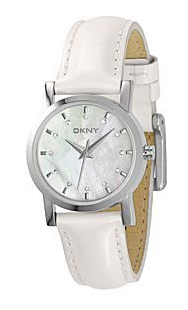 The DKNY white patent leather strap model, price, $85 from Dillard's or other stockists, is classic enough to be familiar, but of the moment. A Gayle Bentley cotton sateen stretch jacket in khaki with white trim will doll up (as my mother would say) any bottom; price, $178 from Neiman Marcus. The cut is ample enough for an 80+ but the ruffled edges and cuffs say "still got it". 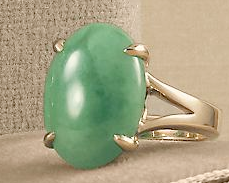 My forthright, glamourous godmother was 91 the last time I visited; on her left hand, she wore an exquisite jade ring. I recall the play of green against her pink cashmere cardigan. This jade ring set in 14k might be a splurge, but you'll see the point: just because she was past 90, beauty was not solely in the past. Price, $2,000 from Gump's. Foxcroft's wrinkle-free shirt comes in a wide range of colours, (shown, pink punch) in sizes up to 18. Classic styling in delicious shades, plus low maintenance make this a winning gift. $42.95 from Appleseeds or department stores. Whether traveling or not, Mum will approve of Tilley's TilleySilk Women's Cittá Pants, made from a Japanese microfiber that feels and drapes like silk, yet is washable. Hang to dry, wrinkles fall out. 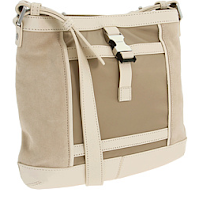 Elasticized at back waist, with two exterior and one inner security pockets. In navy, black and teal, size range from XS to 3XL. Price, $135; coordinating pieces also available. My mother had at least twenty handbags, none more recent than ca. 1990. But all perfectly good! You know how they think. I might gi ve this leather, suede and fabric DKNY Urban Fusion Small Crossbody, 11"x 10", on sale at Zappos for $111.20. And I'll take one too. One way or another, we are all our mother's daughters. Wonderful suggestions. I might have to snap up the turquoise necklace for myself, and the white watch looks fresh and snappy for the warmer weather. Wish I still had a mother to spoil. Very well done, Duchesse. Your gift ideas are practical too. Many older people say, that they don´t n e e d anything, that they are perfectly happy if you just come over.. But, we women are not against a small gift ever. 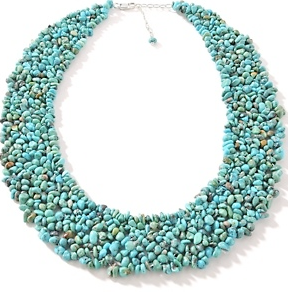 I can picture the turquoise necklace well on a grey haired woman. A beautiful shawl would be great too, maybe a bottle of her favorite perfume or a body lotion of it, or maybe even a totally new scent. These are great suggestions! I'll be on the lookout for something along these lines for my MIL. Those soft trousers might be just the thing, as she still travels a couple of times per year. I love the turquoise necklace and I am only 55...great ideas...you have an eye for the appropriate...a personal shopper for many of us! Thank you for your excellent suggestions...I am taking my mother out for an afternoon tea in a private club with an ocean view. You really have a great eye. My mom loves a gorgeous ring that makes a statement as well, and the watches and purse are right on target as well. In fact I think that bag may be winging its way to my mom soon as she could really use an updated bag and that one has just the style and features she would want. I would say a beautiful lunch and champagne...Just the two of you..
Good reminder. My mother has always been so undemanding that she's happy with just flowers, or a call, or a card. This year I gave her a shirt, just because. I'm going to say it was my Mother's Day present to her. Which is probably shirking my duty. Oh dear. My mom never observes Mother's Day, so I don't feel I can (and I'm really not personally interested). However, Gary's mom is 84 and considers it a national holiday. She's also a women's petite, which makes shopping a challenge. Thank heaven for Talbots. I am starting to have some fun shopping for her, and since she has sons only, this is a new experience for her. However, she's incredibly particular. Thank you for the suggestions! Do you have any lines on women's petites? metscan: Fragrance is always a delightful gift, and if giving her signature fragrance, body lotion, shower get etc may not something she might have already. Pseu: I have always found great gifts for my MIL there, she loves Tilley. But never the dreadful Tilley Hat. Beatnheart: Champagne for any occasion or none, if you ask me! LPC: Ah, the gift-that-counts-as-gift-for-later-occasion move. s: That would look fantastic on you! hostess: Well, hoped to avoid the "little old lady" look and would wear that necklace myself! mardel: Have seen that bag in person, it's well-designed. All of these are lovely ideas for Mother's Day except maybe the jade ring from gumps for $2000. Beladora2.com would skip the quadruple key markup and probably charge around $500 for the same ring. While my mom might be pleased with any of these lovely choices, she's also quite likely to turn around and re-gift it. I know I'm lucky, as you say, to be over 50 and still have her with me, so I will make sure to mark the occasion by taking her out for lunch and a spot of window-shopping. Belle: I *know* Gump's charges a premium. However, when I think of giving an elder women jewelry, I would choose one of your stunning current pieces like the pearl Orbit earrings, but no vintage, unless I knew she was crazy about a specific period. materfamilias: if she is likely to be pleased, I have difficulty understanding why anyone would regift- but have seen people do it, sort of a potlatch approach. Have a wonderful day with her. Summer sunhats other than Tilleys or ball caps could be a subject in themselves - I did look at your hat tag first, and see lots of hat ideas for cool weather, but not for women or men who have to protect their middle-aged or older scalps and faces from the sun while no looking pathetic or boorish. These are great ideas, as often people of great age resist gifts, since they are trying to give the things they have acquired over their lives away. déjà pseu, Tilley clothes are sturdy and beautifully made - unfortunately they were often dowdy but they seem to be paying more attention to styling now. Like others, I love the necklace. I can't really get my mother anything material, since she's kind of a shopaholic....it's actually worrisome. A post on which I *commented*, for pete's sake, blush. Thanks!